5Pcs 3.7V 750mAh JST Plug Lipo Batteries for MJX X400 X400W X800 X300C Sky Viper S670 V950hd V950str HS200WRC Quadcopters. • 5x3.7V 750mAh LiPO rechargeable battery replacement, no modification needed! 5-Port Intelligent Charger for 3.7V Lithium RC Batteries. •Charge 5 Pack at one time. 1)Please make sure that the size of the battery is suitable for your drone before purchasing! 2) On receving, please double check whether battery swelled up.If swelled up, do stop using or charging, and contact us in time. 3) Do not overcharge or over-discharge the batteries. 4) Do not charge batteries that are still hot or it might lead to fire or explosion. A fireproof safety bag is recommended for lipo battery storage/charge. 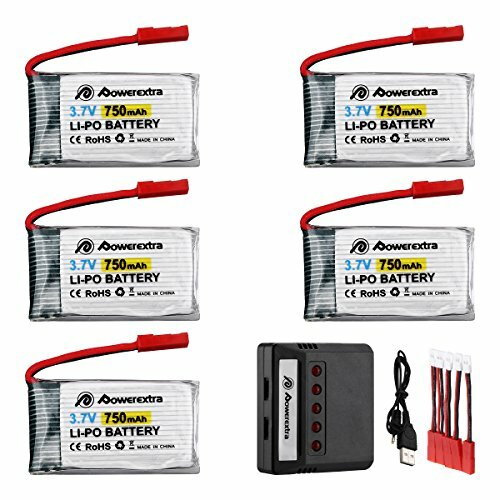 Powerextra 5Pcs 3.7V 750mah Rechargeable Li-Po Battery with 5-Port Quick Charger. Exact Replacement for MJX X400 X400W X800 X300C Sky Viper S670 V950hd V950str HS200W Quadcopter Drone. Charger Voltage input: DC 5V; Voltage output: DC 4.2V; Charging 5 battery at one time, Over charge protection, Short circuit protection.Charger will charge most Molex plug RC Helicopter & Airplane 3.7V 1S Batteries (Hubsan, Syma, UDI, WLToys quadcopter and helicopter batteries). Package include:5pcs Powerextra 3.7v 750mAh LIPO Battery(JST plug),1*5-in-1 Charger,5* the white connector to JST wires.